A comparative wine tasting delivers an educational, side-by-side walk through a series of wines. This system of tasting wines together allows people to see, smell, taste and discern the key components that ultimately determine a wine's overall flavor and style. The set up: In this style of tasting, start by pouring all three well-chilled white wines into three wine glasses for each participant. Shoot for about 1.5 ounces of wine in each glass. Typically, you can get 12-13 participants per bottle of wine if you keep consistent pours. Make sure to pour the wines from lightest body to fullest body. Alcohol levels can often give insight into whether a wine is lighter or fuller-bodied, with lighter alcohol levels often indicating a lighter-bodied wine. One caveat, residual sugar in a wine (like a Riesling) can add the feel of body to a wine. 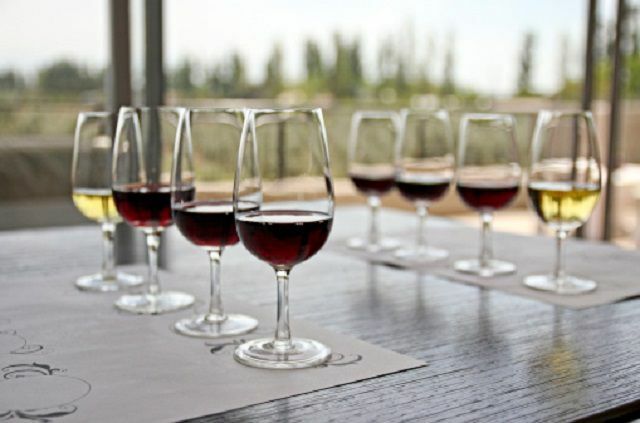 Look, Smell, Taste: Next, evaluate each wine individually by observing the unique color components, aromas, and flavors. Take a moment to compare and contrast shades, is the Riesling or Sauvignon Blanc darker or lighter than the Chardonnay? Are the aromatics leaning into sweeter fruits, florals, or buttery notes? What about flavors. Do the wines taste like they smell? By the end of the white wine evaluations, take a moment to have someone switch the wines around, without watching yourself, and see if you can identify the wines by color first, then smell and then by taste. Once you've run through the white wine trio, turn your attention to the three red wines and run through a similar assessment. Are the colors of the reds more ruby (shows some bluish notes) , garnet (shows some browner specks) or full on inky purple? What about smells? Fruits or flowers? Does any particular spice come through on the nose? Vanilla or cedar nuances from the oak? What does it taste like? Are the tannins firm or fairly subtle? Once you've become familiar with the reds, partner up and switch them around. Can you still figure out which wine is which? Did certain wines stand out as favorites? Why? *If participants drink all of the wine you pour they will have 2 full glasses or the equivalent of nine ounces of wine on board. Keep dump buckets handy, to keep tasters tasting without becoming tipsy. White Wine Picks: Riesling, Sauvignon Blanc, and Chardonnay are three noble white wine grapes that make for an excellent comparative tasting format. With unique palate profiles, distinct aromatics and noticeable flavor differences, all three of these wines present themselves well in a side-by-side format. Red Wine Picks: Pinot Noir is a top pick for the typically, lighter bodied red with silky tannins and fresh, engaging aromatics. Merlot or Cabernet Sauvignon are also top picks for the medium to fuller-bodied wine styles. Shiraz and Syrah or Zinfandel also show well for fuller-bodied wines with plenty of fruit character. By the end of a successful comparative tasting, most people will be able to pick out which wines they preferred and have some sense of why they lean towards a particular wine profile. Find out which white wines work well for a comparative tasting here. Need some specific red wine candidates for your comparative wine tasting? Check them out here.